19th century architecture moved inside a deep contradiction: all the movements aimed at finding their own architectonical language, appropriate for the time but, at the same time, with the best building techniques according to the new times. In this context Modernism was born. Modernism is an attempt to finding a modern style, accurate for a new century everybody was waiting for enthusiastically. They wanted it to have not links with the past and based on the new material. This style was not only international, but it also expanded to all the art and design spheres, creating a decorative environment, controlled by the architects. It covered from the houses to the metro stations, from furniture to interior decoration, even the clothes of the proprietors. This style received different names depending on the region: Modernism in Spain, Art Nouveau in France, Modern Style in Britain, Jugendstil in Germany, Sezessionsstil in Austria. In Britain the ugliness of the designs, the monotony of production in chain and the fear of alienation provoked a movement conducted by William Morris who tried to recover the quality of design and crafts production and Modernism was its direct heir. The same ideas expanded in other places of the continent. 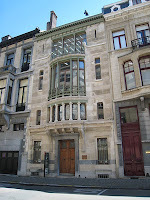 Among the first manifestations of the style are the works of the Belgian Victor Horta, who applied the new conceptions in his Tassel House (1892). Here he developed a new concept of architecture based on the rational use of iron but without renouncing to treat it in an expressive and decorative way with cures and lineal rhythms very refined that gave to the columns, girders and handrails flower shape. From Belgium, and thanks to the fast diffusion of printed press, it expanded all over Europe, finding in Catalonia one of the most important regions due to the enthusiastic baking of industrial bourgeoisie. There appeared one of the most important and original architects of the movement, Gaudí (1852-1926), whose architecture, highly plastic, almost sculptural, looks to be made of natural forms. Gaudi also realised the decoration of the buildings, trying to keep coherence between exterior and interior. Other architects of the period in Spain are Domènec I Montaner and Puig I Cadafalch. In Barcelona the Modernism reached to all the cultural aspects, with painters such as Rusiñol, Ramón Casas, Nonell. The new style affected basically architecture and decorative arts, but it also influenced on all the others. Its theory expanded with the illustrated magazines, speeches, exhibitions that were useful to expand the knowledge of technical advances. In this way there were established the basis of the style to which each country added its own particularities. For instance, while in Belgium, France and Spain curves and flowers are essential elements of the style, in Britain, Scotland or Germany it is geometrical. In all the cases it was a reaction against the eclecticism and its inspiration was nature and symbolist painting. In decorative arts it aimed at offering quality against the vulgarity of massive industrial production. In this aspect followed the British Arts and Crafts movement, fostered by William Morris. In the continent it was not against chain production, but it tried to link art and industry to offer beautiful products that could be bought by almost every body, even when the design in an artisan way made them inaccessible for a majority of the population, but very appropriate for the rich industrial and financial bourgeoisie. In architecture they looked for flexibility of the line and sinuosity with decorative finality; they used coloured materials and moulding stone; bars, balconies and supports were made in forged iron. The new materials offered to the architect complete creative freedom. They assumed not only the structural and building process but also the decorative and furnishing, making of them real designers. Interiors were organised as a surface of sinuous and sensual lines, with a naturalistic tendency. There were harmonic wholes created with freedom and fantasy. They looked for the pleasure of the integration of beauty and welfare. Nature was translated to the interior, making it flexible, instable and light. Materials were of great variety: iron, mosaic, wood. Sinuous lines were elongated on walls and floors, in a kind of vegetal metaphor. The work is organic, extracted from nature; the use of flower elements with decorative purpose created an smart atmosphere. The main centres of production were France, Belgium, Germany and Austria. 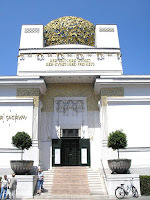 Among the authors we can mention Victor Horta, the pioneer, Van de Velde and Otto Wagner in Wien. In Britain, In Glasgow, Scottish architect Charles Rennie Mackintosh also developed a rectilinear version of art nouveau, which he employed in numerous buildings and their furnishings. 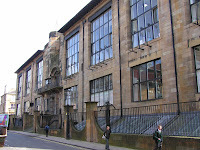 In the Glasgow School of Art, completed in two phases (eastern section 1897-1899, western section 1906-1909), he used contemporary materials in an elegant, angular style. The simple shapes of the brick and stone exterior clearly indicate the division of space within the building, while large expanses of glass provide a strong visual connection between the interior spaces and the outside world. Window mullions (dividers between panes of glass), doors, and fences use ironwork in an elegant linear or geometric manner. This seemingly simple design offers a strong contrast to the ornate architecture based on past styles that was typical of the time. In Belgium Art nouveau architecture, in Brussels, flourished in the work of Belgian designers Victor Horta and Henry van de Velde. As did Mackintosh in Glasgow, these Belgian designers sought to create a new style, free from the historical references of prevailing traditions. They utilized standard wrought iron and cast-iron technology, but employed it to create distinctly new forms. In the Hôtel Tassel in Brussels (1892-1893), Horta not only revealed the structural column that supports the second floor, but transformed its cast-iron form into a plantlike stem that terminates in a burst of intertwined tendrils as it connects with other structural elements. 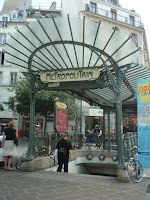 In France designer Hector Guimard designed entrances for the Metro stations in Paris (1898-1901) using simple metal and glass forms decorated with curvilinear wrought iron. These are especially memorable examples of art nouveau's delightfully curving naturalistic forms. Art nouveau took hold in a number of German-speaking cities, the most prominent of which were Munich, Darmstadt, and Weimar in Germany, and Vienna in Austria. Known as Jugendstil (German for “youth style”), art nouveau was promoted in Munich through periodicals such as Die Jugend (The Youth). Stylistic trends in Vienna took a significantly different direction. Led by Austrian artist Gustav Klimt, young artists and architects formed a group called the Wiener Sezession, or Vienna Secession, in protest against the entrenched conservatism of the art establishment in Vienna. As did their counterparts elsewhere in Europe, Secession designers rejected historical styles; but in Vienna they expressed this through an increasing simplification of form. Rather than embracing the writhing organic forms of Endell or Obrist in Munich, Viennese artists moved towards the restrained geometric designs exemplified by the work of Charles Rennie Mackintosh.